this is gorgeous... love the your tart mold... Those apples are so tiny and cute, I really like their color (yes, like pink little pearls) and the way you have sliced them. Great photos (especially the last one)and styling as well. Now, I'd love to have a slice of this beautiful tart! 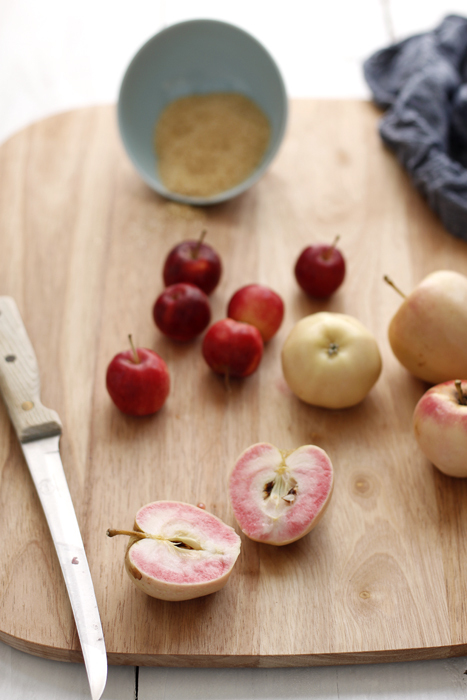 I loved hearing about these beautiful apples, and your dish and photography does them justice. They almost look like rose petals in the tart! I have never seen Pink Apples! Are they sour? Sweet? do they taste tart? What beautiful apples! Love the tart you made with them too. 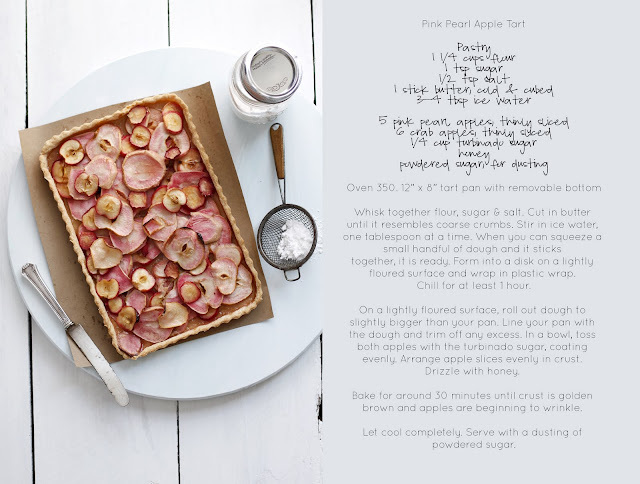 What delectable apples to make such a enticing tart. Thank you for celebrating the arrival of autumn with us. so pretty. everything you make looks so delicious. i cant wait for the weather to cool so i can bake some of your recipes here. the apples themselves are a real eye-catcher and your photography does them justice. the tarte sounds delish! Truly gorgeous! Love those pink apples. Apples definitely give that whimsical and rustic feel when they're tiny and cut so the seed pockets are still visible. The pink is a nice tinge of color. Pretty recipe. I haven't seen Pink Apples before. What time of the year are they available? this is beautiful. Perfect for the fall! 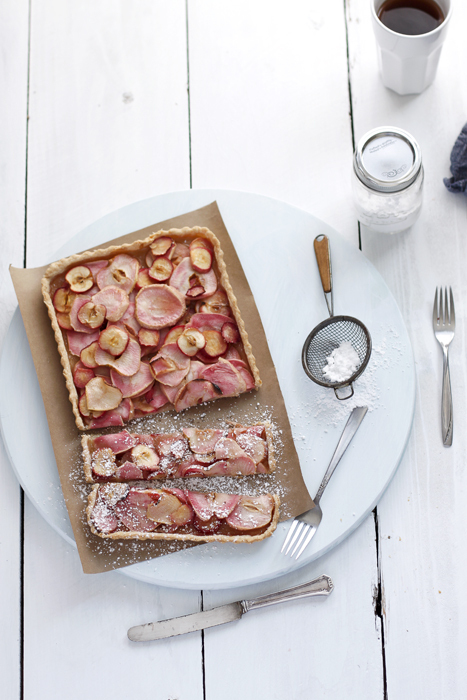 Such a stunning tart, i love the way you sliced the apples on the top. Beautiful photos. It is so lovely when you find an unusual and beautiful ingredient to cook with. 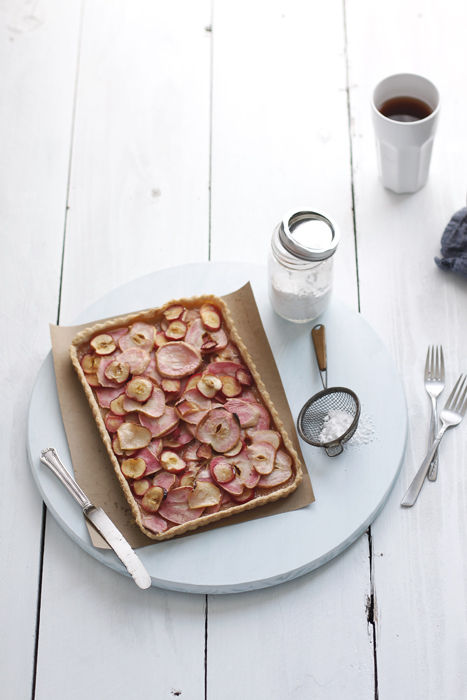 The tart looks amazing, pink flesh and all! what stunning photos! Those apples are magical! I have never seen anything like them! Your photography teacher must be so proud of your work!!! Your blog is gorgeous .. I've never had pink pearl apples but they look fantastic! I have never seen nor heard of pink pearl apples - they're so beautiful! And so is your tart. Truly gorgeous!